‹The machine with its modern design and construction is well established in the printing field and the allied trades, such as ink and paper manufacturers and process houses. The care and thought put into the manufacturing of the press provides everything for a speedy, accurade working.› FAG Standard catalog, early 1950ies. 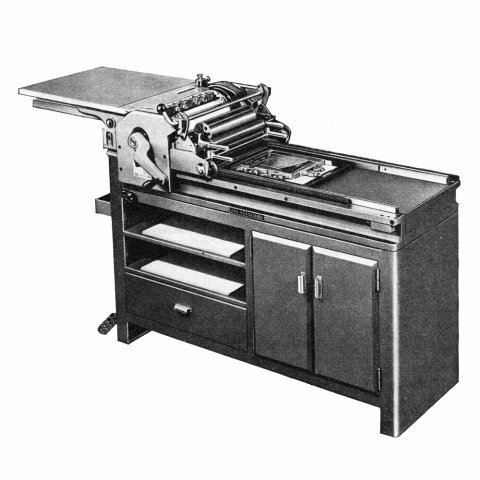 The early FAG Standard Models (510 and 550 with its styles TP, AP, CP, LP and RP) where probably based on similar Vandercook models like Vandercook No. 4. They were produced in Singen, Germany. The FAG Standard 510 and the Standard 550 (with adjustable bed) was built in 5 different styles and all of these models could be equipped with a power driven cylinder and lots of more optional equipment. FAG Standard TP-510 from a catalog from the early 1950ies. FAG Standard AP-510 from a catalog from the early 1950ies. FAG Standard CP-510 from a catalog from the early 1950ies. Test Press for the letterpress printer for proofing and testing of individual form elements or pages, producing of customer pulls, making of overlays, progressive pulls, etc. Cylinder packing 1mm. Modern cylinder proofing press for the process house, stereotyper or electrotyper. Pulls are made on production press principle giving a true image and guide to the customer. Cylinder packing 1mm. Though available on all models, the optional register base plate RFP, vacuum register plate with vacuum pump PLA/VAK, swing out hand frisket frame HFF and the automatic frisket AFR have been specially desinged for the AP-510 and AP-550. Equipped with high polished tension roller for use with H-2 Typefilm. The one sinde printed H-2, easily and speedily produced, is an outstanding printing down medium for offset, photogravure and Dow-etch. 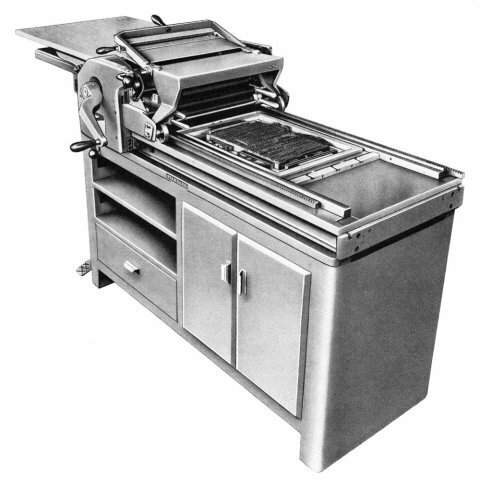 With hard cylinder packing dressing mounted, the press is also used for all letterpress work. Cylinder pakcing 1.75mm. 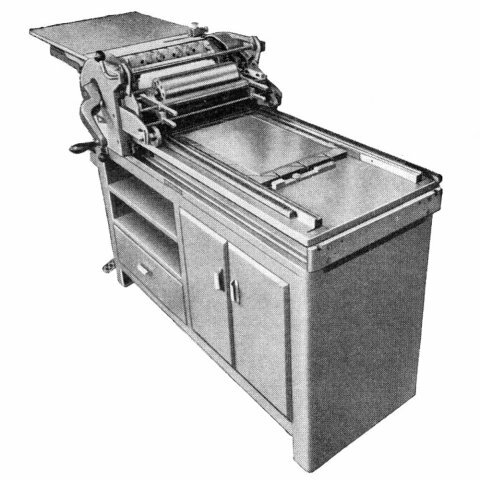 Later, this press has been canceled and the TP-510 has been used for printing H-2 Typefilm. Specially equipped for work in research and test laboratories, e.g. ink and paper manufacturers. By changing to offset rubber blanket, testrs with indirect printing can also be made. Cylinder packing 1.75mm. Though available on all models, the optional split steel rider unit and the center side lay have been specially desinged for the LP-510 and LP-550. The FAG Standard Models 510 and 550 vary only in the adjustable bed that came with the Standard 550. All models TP, AP, CP, RP and LP would exist as a Standard 510 and also as a Standard 550. Also all of these models could be optional equipped with a power driven cylinder! The inking system with that early clutch system (pretty similar to the Vandercooks No 4) has been modified in several steps during the years.